DJ Shadow (birth name Joshua Davis) is an American music producer, DJ and songwriter. He was born on June 29, 1972, in San Jose, California, USA. He is often considered as a major creator of U.S. trip hop. His was influenced by various bands such as Kurtis Mantronik, Steinski and Prince Paul. He began to work as a disc jockey while his studying at the University of California. He quickly attracted attention of Solesides record label and was signed with this record company respectively. He released several singles, "In/Flux" and "Lost and Found (S.F.L. )", on Solesides. His debut album, Endtroducing..., was released in late 1996. This album received good critical reviews. And now, you may download DJ Shadow's breakthrough debut album, Endtroducing.., in mp3 from our site. 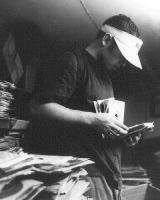 Endtroducing... was also well received by fans all over the world.